WASHINGTON (CN) – Once in danger of erosion, the ozone layer is set to be fully healed by 2060 thanks to decades of corrective actions, a United Nations report published Monday states. Together with the World Meteorological Organization and U.S. and European authorities, U.N. researchers found that the mid-latitude ozone layer in the Northern Hemisphere is expected to fully regenerate completely sometime in the 2030s, with the Southern Hemisphere’s layer expected to be fully healed by the 2050s. 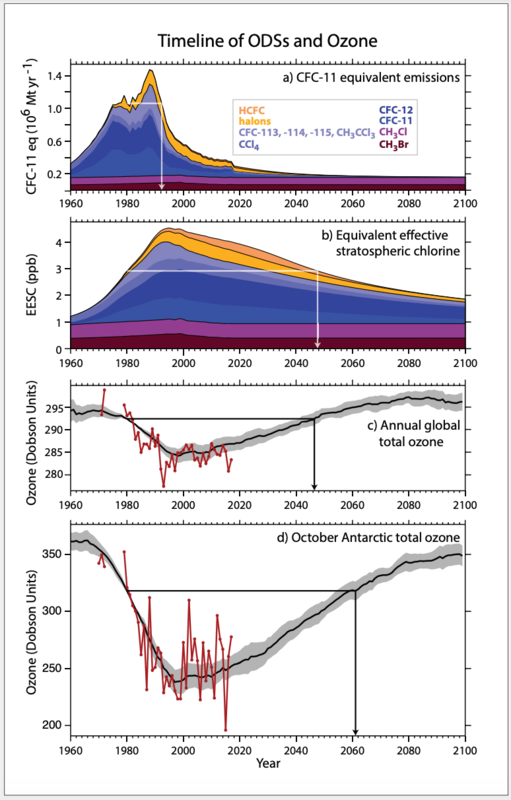 The polar region’s ozone layer, which had been most at risk, is expected to be fully healed by 2060. The ozone layer in the stratosphere protects life on Earth from ultraviolet rays from the sun, which can cause skin cancer, cataracts and other health problems. The ozone layer was considered at its worst point in the 1990s, when 10 percent of the upper layer was depleted. The report found that the concentration of ozone-depleting substances has gone down since 2014 and has continued to decrease at a rate of 1 to 3 percent since 2000. The reduction is mostly the result of actions undertaken by countries that agreed to the 1987 Montreal Protocol, according to the report. That international agreement was signed after scientists in the 1970s realized that chloroflurocarbons (CFCs) used in aerosols and air conditioning systems were harmful to the ozone layer. Production of CFCs were banned in 1989. The protocol has undergone seven revisions since then, most recently in 2016 when the Kigali Amendment was adopted. That amendment, expected to be enforced in 2019, would further reduce the use of hydrofluorocarbons and other harmful gases in refrigerators and air conditioners. Experts hope complete adoption of the new amendment’s recommendations will prevent 0.4 percent of global warming in this century, thus keeping the global temperature increase under 2 degrees Celsius. The report also warned, however, that protecting the stratospheric ozone was reliant on continued compliance with the protocol. Countries can still take some additional measures to further aid the ozone layer’s recovery, including the elimination of carbon tetrachloride and dichloromethane. This combination of images made available by NASA shows areas of low ozone above Antarctica on September 2000, right, and September 2018. The purple and blue colors are where there is the least ozone, and the yellows and reds are where there is more ozone. 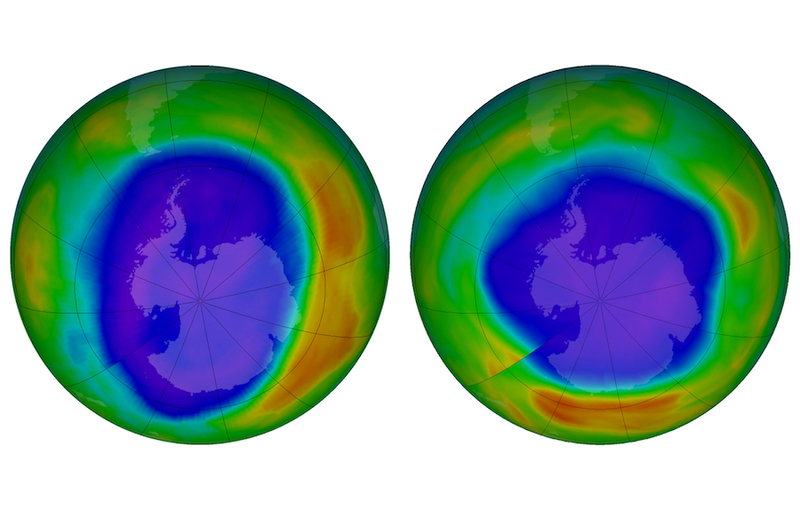 The best news from the report seems to be that for the first time, evidence that the Antarctic ozone hole — the discovery of which in the mid-1980s help galvanize international action — has diminished in size and depth since 2000. Paul A. Newman, the chief scientist for earth sciences at NASA’s Goddard Space Flight Center, said in a statement that the Antarctic ozone hole is smaller than it could have been 20 years ago. The report is part of a series that is released every four years. But another U.N. report released in October predicted that the failure to meet the goals of the Paris climate agreement will cause wide-ranging problems, including a massive die-off in coral reefs, growing world hunger and larger wildfires, within about 20 years. If greenhouse gas emissions remain constant, the atmosphere will warm by as much as 2.7 degrees Fahrenheit, that report found. The United States pulled out of the 2015 Paris Agreement shortly after President Trump took office. Trump, who has been skeptical of global warming and once called it a hoax perpetrated by the Chinese, said the Paris Agreement hurt the U.S. economy. The U.S. is set to officially pull out of the Paris Agreement in November 2020, despite recent polls showing that nearly three-quarters of Americans believe the climate is changing. Other countries also have shown reluctance in curbing ozone-harming gases. Recent reports suggest that factories in China are responsible for the resurgence of CFC-11, which was supposed to be banned under the Montreal Protocol. Scientists last spring found that the reduction of CFC-11 in the atmosphere had started to slow. In September, former Vice President Al Gore called for reductions in heat-trapping pollution and for the United States to rejoin the Paris Agreement.